Earlier this month I found myself in Toronto for a wedding, so I took the opportunity to explore the Greater Toronto Area. No matter where I'm vacationing my trips are always (I'm dead serious) planned around food, so this was no exception. A large part of my boyfriend's family lives just outside of Hamilton so we were excited to explore the area (yes, I'm a converted Ti-Cats fan!). As Hamilton is known for steel production I was not sure of what I would expect, but after some research I found that the food scene is growing and there are a number of restaurants worth visiting. James Street has great character with it's collection of boutiques and galleries, and seems to be the main street where new and trendy restaurants are opening. 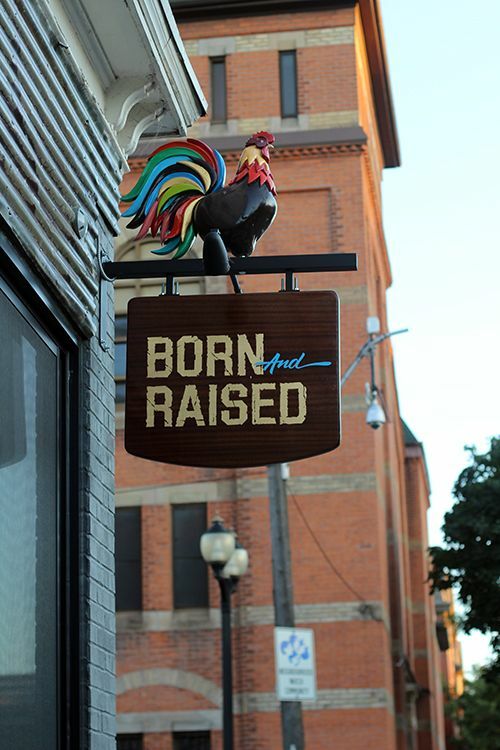 Nestled within the Art Crawl district is where we found Born & Raised. Born & Raised is the second restaurant opened by Chef Vittorio Colacitti, who you may recognize from Top Chef Canada. If the name is any indication this restaurant is a reflection of Chef Vittorio's pride for Hamilton, the city which he calls home. Many quality ingredients are sourced directly from producers in the area, which connects the restaurant with the surrounding community. On our visit the restaurant was just over 2 months old and very busy on a Friday evening. The 60 seat restaurant features a raw bar showcasing beautiful seafood from both the East and West Coast, and is home to a beautiful wood-fired oven imported from Italy. The decor is a mix of modern and rustic, with touches of reclaimed wood and antique collectibles throughout. 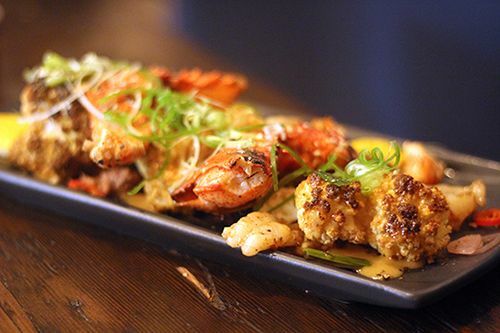 The menu at Born & Raised puts a globally-inspired twist on classic dishes. The offerings are a reflection of what Chef Vittorio has learned through his upbringing in Ontario and culinary training abroad in Europe and Asia. 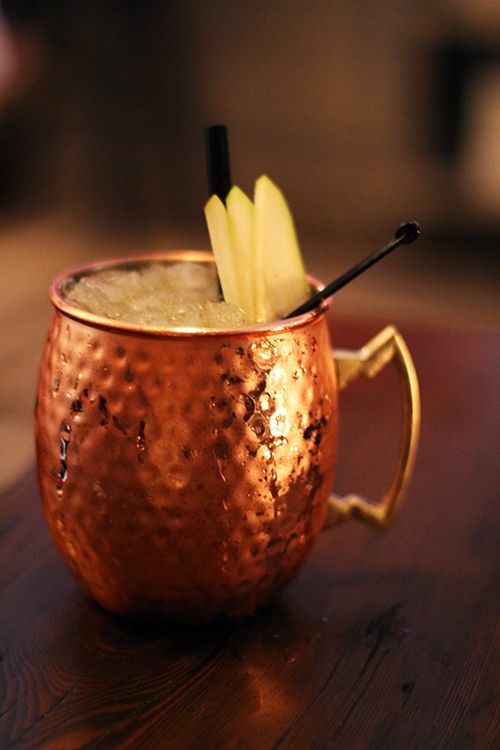 The menu is split into four sections (raw bar, small plates, pizza, and classics) and sharing is highly encouraged. 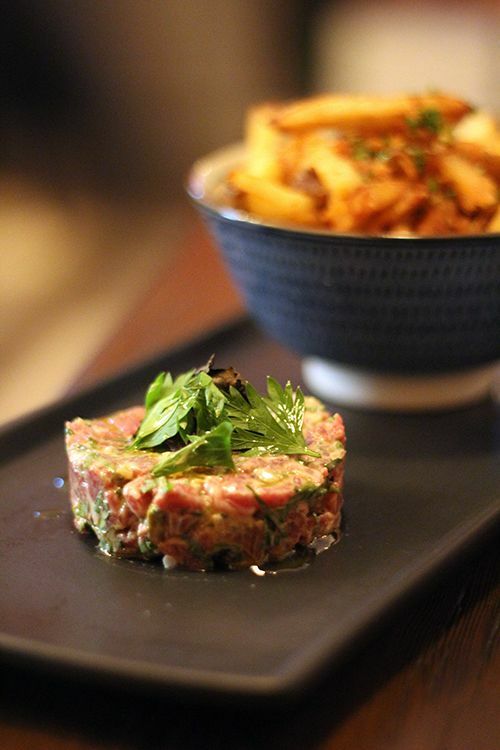 We started our dinner with the Steak Tartare "Le Roy" ($19), which is a Parisian style hand-cut beef tenderloin tartare served with fries. The beef comes from a farm just 20 minutes away in Haldimand County, and this dish was inspired by Chef Vittorio's time as a sous chef for Chef Didier Leroy in France. The beef was well seasoned and tender, while the fries were crisp and golden, just the way they should be. Fries don't do the greatest job of scooping up the beef, making it more difficult to eat than anticipated, but tartare and frites is still a classic. 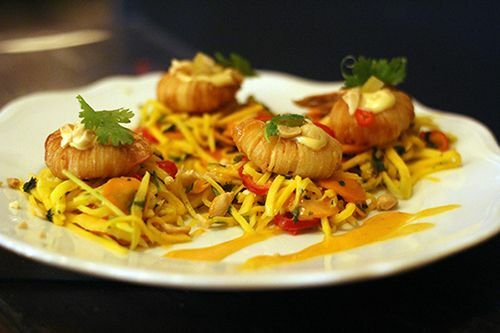 Next came the Crispy Shrimps (3/$15 or 4/$19), served on a bed of green mango salad and topped with crushed roasted peanuts. This dish was a mix of salty, sweet, and crispy goodness with the meticulously wrapped shrimp on a bed of Thai-style mango salad. I'm not the type of person to order soup at a restaurant, but the Ontario Corn Soup ($14) was calling my name. 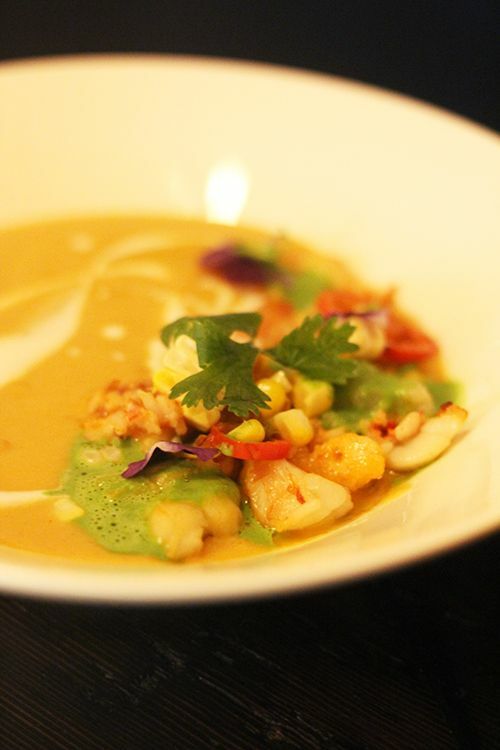 With chunks of Nova Scotia Lobster in a curried roasted corn soup base, this hearty bowl was absolutely incredible, no word of a lie. Perhaps mind-blowing is a better descriptor. The heat was finely balanced with the coconut milk, while the cream was cut with a hint of acidity. It was a complex combination of flavours and umami that I could not stop eating. We regretted not having enough room for a second bowl! Burrata is popular on menus out in Toronto. We honestly had it once a day throughout our trip, but I'm not complaining as it is a rare find here in Edmonton. 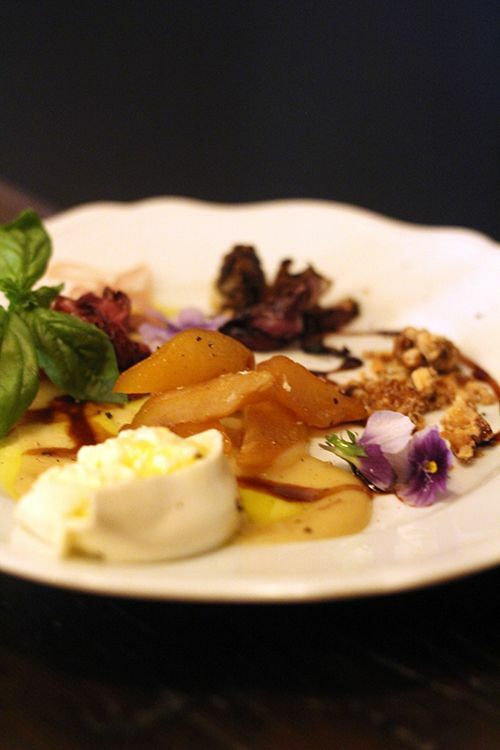 The Burrata with Summer Pears ($14) at Born & Raised brings ultra creamy burrata together with radicchio, aged balsamic vinegar, walnuts, and basil. All the components are plated beautifully and finished with a drizzle of 'Olio Vittorio,' a cold pressed extra virgin olive oil produced for the restaurant by the Colacitti family in Central Italy. Come this Fall, Chef Vittorio will be bringing housemade burrata to the menu, so don't miss out! Aside from bringing some Latin and Spanish influence to the menu, Chef de Cuisine Sebastien Sanchez is typically found making artisan breads and pizzas with the wood-fired oven. The five signature pizzas on the menu range from classic to adventurous, and we chose to try the Monte Pollino ($16) as part of our meal. 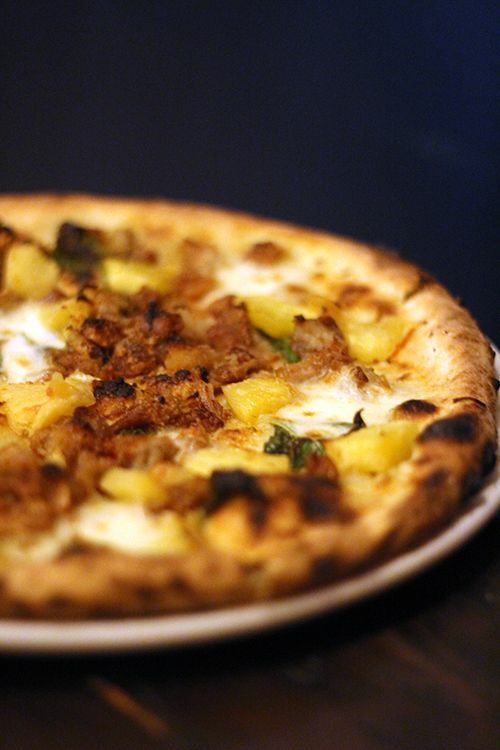 With roasted and smoked confit pork cheek, compressed pineapple, pickled habaneros and basil, this pizza is a unique twist on your classic ham and pineapple. The toppings are generous and the habanero has a serious kick (read: some parts were borderline too spicy for this Asian)! I've mentioned it before and I'll say it again: floppy, soggy pizza crust is a serious pet peeve of mine, and I'm sure I'm not alone. 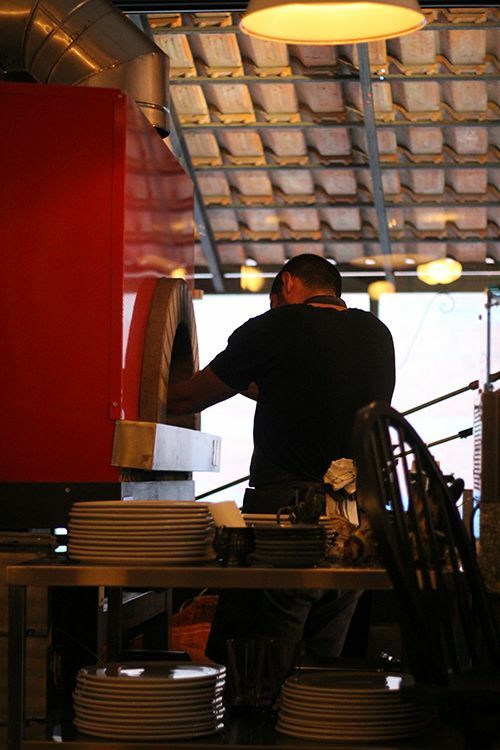 The housemade pizza dough at Born & Raised cooked evenly and rose beautifully in the oven. It retained it's structure when lifted, had a crispy, blistered cornicone, and met my criteria for an excellent crust. When paired with the right ingredients you get a perfect pie. After the savoury dishes we chose to try Susan's Torte ($7) for a sweet finish to the evening. Who is Susan? 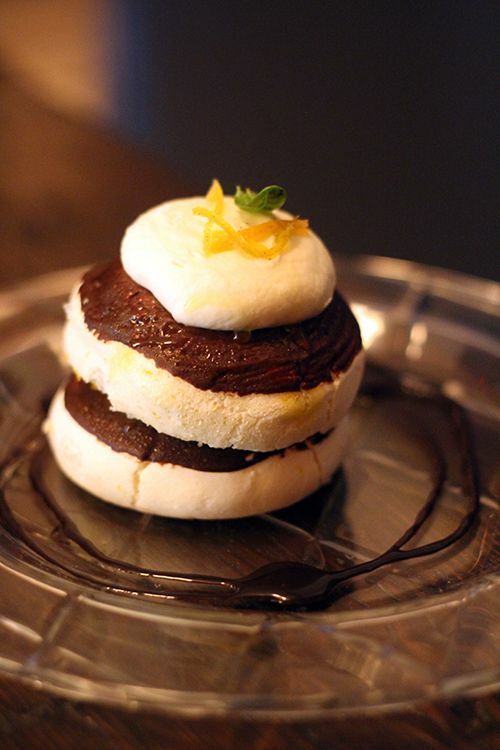 She's Chef Vittorio's mother and the one who gave up her secret recipe for this beautiful dark chocolate meringue with Grand Marnier chantilly cream. 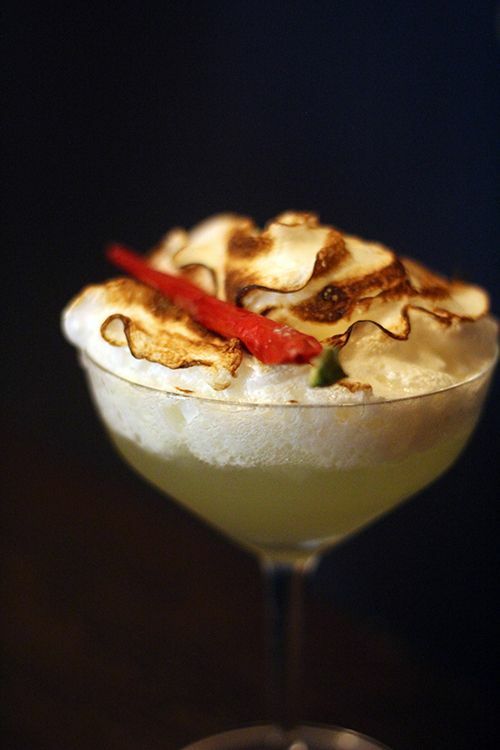 The meringue is light, melt-in-your-mouth, and balanced with a bit of candied orange zest. With the opening of Born & Raised on James St. North, Chef Vittorio and his team are bringing local, seasonal ingredients and their passion for global flavours to the community. 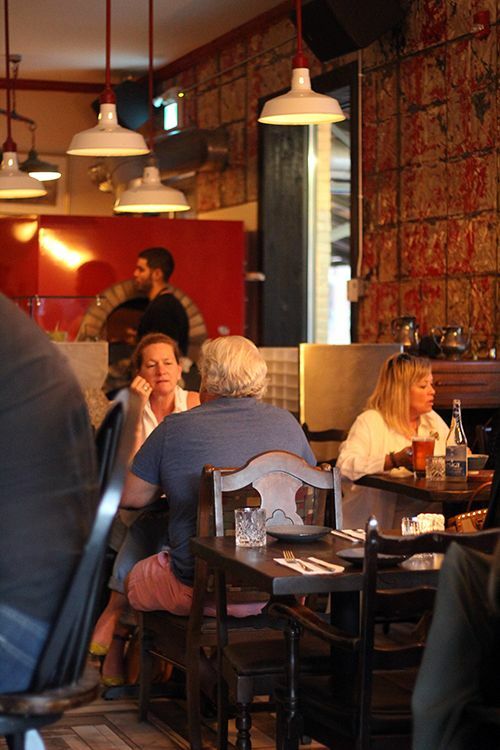 They're in a great location for the post-work crowd, and the warm, vibrant setting is great for get-togethers with friends or casual date nights. Service is friendly although a bit spotty during our visit, given the atmosphere of the busy restaurant on a Friday evening. We had a fantastic meal and will definitely return on our next visit to the area. Like the rooster, which is a symbol of strength and determination, Chef Vittorio leads his team with pride and focus, inspired by the city in which he was born and raised. *Disclosure: I was invited to try Born & Raised and expected to feature a review on my blog. Views expressed in this post are solely mine. This post is 100% my opinion, and as always, my priority is to you, the reader, to present an unbiased, thorough review.